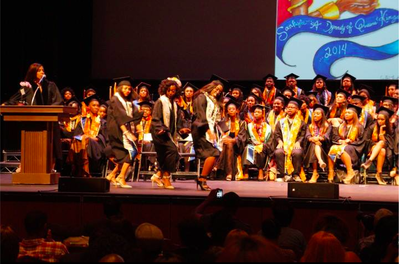 May 25, 2015 – The 36th Annual Afrikan Graduation Ceremony will take place at 5:00pm on Sunday, June 14th, 2015 in UCLA’s Royce Hall. UCLA’s Afrikan Graduation began in 1979 through the tireless work and dedication of fourteen students who decided to create a commencement ceremony for students of African descent. Since then, Black Bruins continue the tradition of recognizing their accomplishments by participating in the annual ceremony. The ceremony, which is infused with the spirit of African culture, strives to celebrate the academic achievements of graduating students individually and as a group, while also promoting retention among the black students on campus. Additionally, the ceremony seeks to unite the extended UCLA community and acknowledge the graduates’ families, for which their accomplishments are mutually shared. 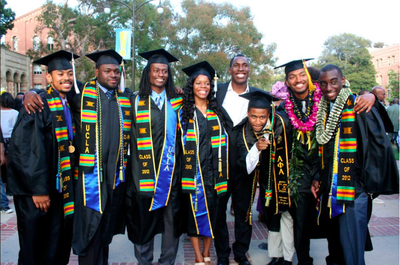 All graduating students, regardless of race or ethnicity, who wish to celebrate the culmination of their UCLA education in the spirit of Afrikan culture, are encouraged to participate in the Afrikan Graduation Ceremony congratulating the Class of 2015!